This is easy to do, and can be used as a basis for various different flavours. 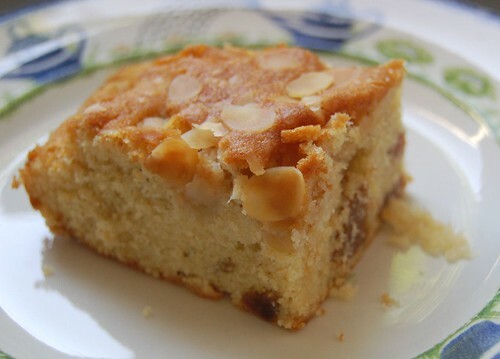 The quantity given makes a large rectangular tray-bake cake, which can be cut into squares for serving, so it’s ideal when you need to cater for a large gathering. It also stores and travels well (put it in an airtight tin when cool). Preheat the oven to 180C (160C fan) and line a 30×25 cm roasting tray with greaseproof paper. Cream together the sugar and butter till pale and fluffy. Add the vanilla extract, then start adding the beaten eggs a bit at a time, beating well. Add about a tablespoon of the measured flour with each batch — this makes the mixture less likely to curdle. Stir in 4 tbs milk. Then mix together the remaining flour and baking powder and fold in with a metal spoon. The mixture should drop easily from the spoon — if it doesn’t, add a little more milk. Toss the fruit, including the chopped apple, with the cinnamon (or use the alternatives below). Fold into the mixture. Spoon into the tin, smooth the surface, sprinkle with almonds, and bake for 35-40 minutes; test with a skewer to see if it’s done. The top should be golden brown; cover with foil if it looks as if it’s burning. Cool for 5 minutes in the tin, then turn out onto a wire rack to finish cooling. Alternative flavourings: instead of the fruit, you could use the zest and juice of 2 lemons, reducing the amount of milk slightly, and/or diced stem ginger in syrup (add a little of the syrup too). How much cinnamon? 3 teaspoons or tablespoons? Thanks! oh, there’s a typo 🙂 It’s 3 teaspoons — I will fix it in a minute.